Section 7, WWF PPV Roundtable: Octavio and his Crew Discuss WrestleMania VI. Can The Warrior draw like Hogan did the past few years? TORONTO, ONTARIO, CANADA --- The Ultimate Warrior made wrestling history at WrestleMania by becoming the first man to pin Hulk Hogan for a WWF Title on a pay-per-view. The match will always be remembered as one of the best main events in the history of wrestling. After the match, Hogan grabbed the WWF Title and gave it to the Warrior as both men embraced in the middle of the ring. Credit goes to both wrestlers for their great match. Hogan did not pass the torch here, but he put Warrior over in front of a huge crowd. This is something that we haven�t seen before, but Hogan probably handed the WWF Title to the right person. The Ultimate Warrior will have to drop the IC Title and declare the belt vacant. The Warrior will defend the WWF Title to different opponents. Hogan will take some time off and feud with The Earthquake. It�s too early to tell if Warrior is the right person for the job, as he plans to carry the WWF on his shoulders for the next few months. Warrior will defend the title without Hogan around, so it�s going to be interesting to see if Warrior will draw attendance for house shows and PPV buyrates. The Warrior is the only wrestler right now to carry the WWF and there were some heels on the roster that probably wouldn�t make it as a draw. Right now, Mr. Perfect and Rick Rude seem to have potential, but they might not be what the WWF is looking for. Hulk Hogan will not be going for the WWF Title anytime soon as he is prepared to feud with The Earthquake. During a WWF Superstars TV taping, Hogan and Earthquake were invited to the Brotherlove Show. Both men were going to go face to face. Jimmy Hart came out instead and told Hogan that Earthquake was sick and couldn�t make it. Hogan didn�t believe Hart and he grabbed him from his tie. Quake came from behind and nailed Hogan with a chair. Quake splashed Hogan three times. In terms of storyline, Hogan is out due to injuries and might not return. The angle is perfectly done as many think that Quake ended Hogan�s career. During the next few weeks leading to SummerSlam �90, Hogan�s close friend Tug Boat encourages fans to send letters to Hogan. Earthquake continues to run through the competition in the WWF. Fans were encouraged to send �Get Well� letters to Hogan while he was out due to injuries sustained by Earthquake. Every fan who would send Hogan a letter during this difficult time will get a postcard back signed by the Hulkster. (I sent him a letter and I received two autographed postcards of Hogan posing and the other as Suburban Commando). Tug Boat made frequent appearances on TV, urging fans to send him letters. Tug Boat also distributed friendship bracelets in order to motivate Hogan while in the hospital. About a month before SummerSlam �90, Hogan had to make an appearance and announce if he is going to retire or keep wrestling. Obviously, Hogan returned and challenged Earthquake to a match at SummerSlam �90. Hogan vs. Quake is co-headlining the event with Warrior vs. Rude. Ultimate Warrior to defend the WWF Title against Rick Rude at SummerSlam �90. Last year�s SummerSlam featured Warrior vs. Rude for the IC Title. Warrior won the IC Title and never lost the belt, since he dropped the title because he had won the WWF Title. The main storyline in this match is that Rude is the only wrestler to pin The Warrior in the WWF. Rude has been training hard for this match. Since both men are 1-1 against each other on PPV, this match will be settled in a steel cage. Bobby Heenan will be at ringside for this match, but he is not going to do anything to help Rude. This match will be the last match of the event as Hogan vs. Earthquake is also the main event of the PPV. Mr. Perfect wins the IC Title in a tournament, defeating Tito Santana in the finals. The WWF wasted no time in conducting a tournament for the vacant IC Title. Perfect was the right man for the job as he defeated Santana in the finals of the tournament. After the match, Perfect introduced his new manager and that was Bobby Heenan. Perfect is now focusing on defending the IC Title against Brutus Beefcake at SummerSlam �90. Demolition add a third member to their team and turn heel in the process. The Hart Foundation will receive a tag team title shot for the first time in nearly two years when they face Demolition at SummerSlam �90. Demolition turned heel after adding a third member to their team. Crush (real name: Brian Adams) is the third member of their team. The Harts do not know whom they are going to face of the three men, but they have a small advantage, as this match will be 2/3 falls match. Most likely, Smash and Crush will wrestle, while Ax stays at ringside. Ax is the oldest of the three and he might leave the WWF shortly after SummerSlam �90. Brutus Beefcake suffers face injuries during parasailing accident. Few weeks before SummerSlam, Beefcake went boating and suffered several face injuries that will require Beefcake to take a lot of time off or maybe call it quits. More details on Beefcake�s injury next month as we progress to the next PPV. Beefcake will not wrestle Mr. Perfect as stated above. His replacement will be announced in the WWF TV Highlights section. IC Title Tournament Results: In the first round, Mr. Perfect defeated Jimmy Snuka, Tito Santana defeated Akeem, Dino Bravo and Brutus Beefcake wrestled to a double count out, and Roddy Piper wrestled to a double DQ with Rick Martel. Since only Perfect and Santana were alive in the tournament, both men wrestled in the finals and Perfect won the IC Title. Crush debuts on WWF Superstars: Crush made his debut on WWF Superstars and wrestled in his first appearance, by teaming with Smash. Earthquake took a toll on Tug Boat a week before SummerSlam �90. A week before SummerSlam, Earthquake attacked Tug Boat, making him change his plans for the co-main event. Tug Boat was scheduled to be at ringside for Hogan as Dino Bravo slated to side with Quake in that match. Big Boss Man is now replacing Tug Boat in this match and he will make sure that Bravo doesn�t interfere in the match. Sgt. Slaughter returns to WWF, this time as a heel. Slaughter is set to be a special guest on the Brotherlove Show and he will be a heel. Slaughter, who played the great American hero during the 80s, will now be against his country and will side with Iraq. The Bolsheviks break up as a tag team and Nikolai Volkoff sides with USA. Volkoff will now wrestle as a singles wrestler, as Boris Zhukov will leave the WWF. Volkoff turns babyface, joins Jim Duggan, and will now carry the USA flag to the ring. Volkoff has more than 5 years in the WWF. Hercules turns heel again and joins Paul Roma as Power & Glory. Hercules was tired of jobbing as a babyface and Paul Roma was tired of being simply a jobber. They both got together to form a tag team known as Power & Glory. They are going to be managed by Slick and they will face The Rockers at SummerSlam �90. Sapphire is hinting that someone is buying her jewelry, fur jacket, etc. Rumors are that Ted DiBiase is buying her all that stuff just to get to Dusty Rhodes. Rhodes might feud with DiBiase after he�s done with Savage at SummerSlam �90. Dusty is not really happy with Sapphire getting all these expensive gifts. Sapphire is scheduled to wrestle Sensational Sherri at the PPV and Rhodes will face Savage to end the feud once and for all. Kerry Von Erich debuts for the WWF as the �Texas Tornado�. Von Erich makes his debut for the WWF and his first PPV match will be a title match against Mr. Perfect. Von Erich replaces Beefcake in this match and he is already a favorite to win the match. With such short notice, Perfect is now complaining that he just entered the WWF and is receiving a title shot. Von Erich looks huge in his debut. Here is the line-up for WWF SummerSlam �90 PPV, which will be held on Monday, August 27, 1990 at The Spectrum in Philadelphia, PA: Ultimate Warrior vs. Rick Rude for the WWF Title in a steel cage, Hulk Hogan vs. Earthquake (Boss Man and Dino Bravo will be at ringside for both men), Randy Savage vs. Dusty Rhodes, Sapphire vs. Sensational Sherri, Jim Duggan & Nikolai Volkoff vs. Orient Express, Jake Roberts vs. Bad News Brown (w/ special guest referee Big Boss Man), Demolition vs. Hart Foundation for the Tag Team Titles in a 2/3 falls match, Kerry Von Erich vs. Mr. Perfect for the IC Title, The Warlord vs. Tito Santana, and Power & Glory vs. The Rockers�Big Boss Man will be a busy man at SummerSlam, but he will not wrestle. He will referee a match and also be in Hulk Hogan�s corner during the co-main event�Speaking of Boss Man, I still don�t get why he is not facing Ted DiBiase in the event. DiBiase doesn�t have an opponent for the PPV as well, but is scheduled to make an appearance with Sapphire. Also, they aired several vignettes with DiBiase visiting Cobb County, Georgia and paying people there to talk trash about Boss Man�Brian B. Blair, who wrestled in the WWF with Jim Brunzell as The Killer Bees, went boating with Beefcake during that accident. 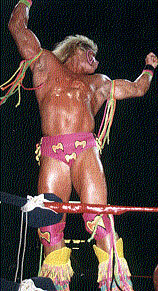 Octavio Fierros: (9.0) Best Match: Ultimate Warrior vs. Hulk Hogan; Worst Match: Koko B. Ware vs. Rick Martel. This was a great PPV that will always be remembered when we were young and believed in Hulkamania and the �little warriors�. I haven�t marked out since WrestleMania III when Hogan slammed The Giant and during this PPV, The Warrior winning over Hogan was one of the best mark-out moments in wrestling history. Everyone seemed to click during the event. Andre turning babyface was surprising as well. The crowd was awesome too and they made the PPV what it was. WrestleMania VI MVP was Ultimate Warrior due to his great performance. Hogan was slightly the runner-up. Matt Riggs: (9.0) Best Match: Hogan-Warrior Worst Match: Koko-Martel. WrestleMania VI is one of the greatest WrestleManias in my opinion. The main event was a true dream match that lived up to the hype, and that�s rare in professional wrestling. Andre The Giant couldn�t have gotten a better send off with his face turn and attack on Bobby �The Brain� Heenan. Monsoon and Ventura did a good job calling the action, as usual. It�s odd remembering back how important it actually meant when Demolition became tag champions for the third time, and comparing that to how meaningless it is to the number of reigns the Dudleys have had. The mixed tag team match was fun to watch. Mr. Perfect and Brutus had what I consider Beefcake�s greatest match. The only big match that I didn�t think lived up to the hype was the Roberts/DiBiase match. The count out ending was kind of flat for a feud that had been boiling for nearly a year. Steve Allen�s interaction with The Bolsheviks ranks right up there with Bob Uecker and Pete Rose�s Mania appearances. Overall, it was a great event to kick off the 1990�s. Charles Seaman: (9.0) Best Match: Hulk Hogan VS. The Ultimate Warrior, Worst Match: Tito Santana VS. The Barbarian To me, WrestleMania VI is a very special event, as it is the card that made me a wrestling fan. From top to bottom, I felt it was a solid card for the time and reflected an awesome period in the WWE (then WWF). The main event is my personal favorite match ever. The undercard was pretty good too. One of the matches that sticks out to me is Demolition defeating The Colossal Connection to win the Tag Titles for the third time. I highly recommend this card if you are a fan of the WWE from that era. If you would like to be part of the SummerSlam �90 PPV Roundtable, send me an e-mail and I�ll get back to you. Just make sure you�ve watched the actual PPV before saying your thoughts about the show. Thanks! The e-mail is: octaviofierros@yahoo.com - Thanks!